WE PROVIDE QUALITY RESTORATION SERVICES TO ALL OUR RESIDENTIAL AND COMMERCIAL CLIENTS. WE RESTORE/REFINISH ANY TYPE OF FLOORING INCLUDING, BUT NOT LIMITED TO, PARQUET, OAK, MAPLE, PINE, BAMBOO AND BRUCE HARDWOOD ! SANDING HARDWOOD FLOORS TAKES EXTREME PATIENCE AND CLOSE ATTENTION TO DETAIL. HIRING THE RIGHT COMPANY FROM THE BEGINNING WILL PUT YOUR MIND AT EASE AND SAVE YOU TONS OF TIME. WE'RE THE ONLY COMPANY WHO CARES MORE ABOUT YOUR WOOD THAN YOU! WE ENSURE A CLEAN HOUSE AT THE END OF EVERY WORK DAY. OUR GOAL IS NOT ONLY TO SATISFY OUR CLIENTS, BUT TO AMAZE OUR CLIENTS! WE'RE THE STAIRCASE PROFESSIONALS! 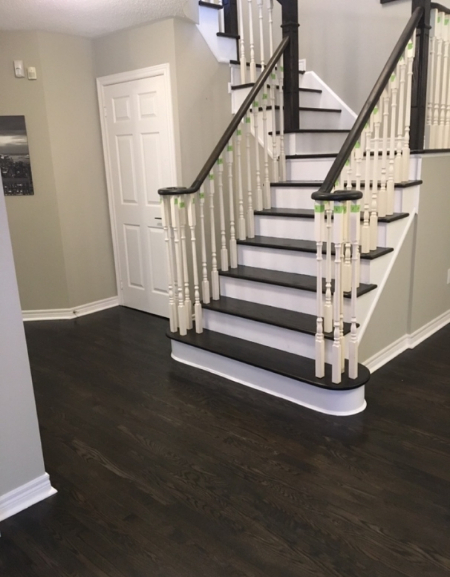 WE USE A SPECIALIZED PROCEDURE WHICH SEPARATES US FROM THE COMPETITION, IN ORDER TO ENSURE THE SMOOTHEST STAIRCASE POSSIBLE. WE ENCOURAGE YOU TO FEEL ALL YOUR STEPS AFTER WE'RE DONE. AN AMAZING REFINISHED PROJECT CONSISTS OF USING THE RIGHT TOOLS. WE USE ONLY THE BEST QUALITY MACHINES AVAILABLE FOR HARDWOOD SANDING, FLOORS OR STAIRS! INVESTING IN THE PROPER TOOLS IS WHAT SEPARATES THE PROFESSIONAL REFINISHING COMPANY FROM THE AVERAGE COMPANY WITH CHEAP PRICES. WE OWN ALL OF OUR EQUIPMENT. BUILT IN 2O17, OUR DUST CONFINEMENT IS SECOND TO NONE! I've hired Jason twice now and both times I've been thrilled with his work! He refinished the original floors in my home as well as patched a spot where a wall was moved. The patch looks so good, you cannot tell it wasn't part of the original floor! Jason is very professional, honest and hard working. I would highly recommend him! We have an old house and wanted to get rid of carpet and refinish the old hardwood floors upstairs. Jason was confident we could keep the original floors and refinish them to look new. He did a great job and we are happy! We are really happy with the work and absolutely love our new floors! You can see the before and after from the risers on our stairs. We will be painting those white. Such a nice change! Would definitely recommend his work. © Copyright 2018 - Toronto Restoration Service.